All transactions are safe and secure with a reliable history in online purchasing behind each of our associates. 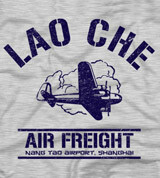 Buy the Lao Che Air Freight Indiana Jones shirt to own Indiana Jones clothing and merchandise. The design on these Indiana Jones t-shirts displays a logo for the fictional airline from The Temple of Doom, Lao Che Air Freight. The airline is owned by Lao Che, a Chinese crime lord who nearly kills Indiana Jones by poisoning Indy's drink. Lao Che's men chase Indy to Nang Tao Airport, where he had chartered a plane to get out of Shanghai. The only problem is that the plane belongs to Lao Che Air Freight. Add this to your Indiana Jones gear. In addition to the Lao Che Air Freight Indiana Jones tee above, browse the Indiana Jones Clothing Gallery for more apparel like men's and women's clothes, kids shirts or hoodies.